Hotel Gened , 3-star superior hotel in Pinarella di Cervia, offers recently renovated air-conditioned rooms, a sun terrace with two hydromassages, WI-FI and parking. Services for disabled people available. No pets allowed. 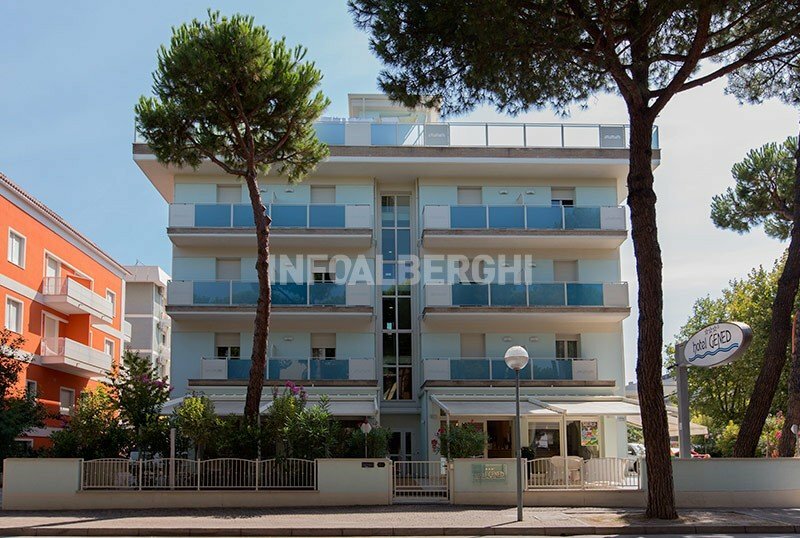 The hotel is located a few steps from the centuries-old Pinewood of Cervia and a five minute walk from the beach. Recently restored, they have a balcony with chairs and tables, electric shutters, air conditioning and heating, digital LCD TV, telephone, safe, minibar, private bathroom with shower and complimentary toiletries, hairdryer. Possibility of breakfast in the room for a fee. FAMILY : available "family" solution, consisting of two connecting rooms of about 11 sqm each with a balcony, common entrance and bathroom with shower. There is a sun terrace with loungers, beach umbrella, showers and two hot tubs, garden, outdoor and indoor playground area, open-air porch, bicycles (free for the first 3 hours of use and available in full board and all inclusive), bar, elevator, evenings theme, newspapers, paid laundry. PARKING : uncovered with limited places. WI-FI : present in the common areas. AIR CONDITIONING : available throughout the structure. CONVENTIONS : beach, amusement parks, Inail / Inps. SERVICES FOR DISABLED : entrance on the ground floor, elevator in accordance with room, room with maneuvering space for wheelchairs and aids, bathroom with accessible shower and shower chair. BREAKFAST : sweet and savory buffet, with homemade cakes. LUNCH AND DINNER : four menus with meat and fish, followed by a buffet of vegetables and side dishes, desserts and fruit. Cuisine inspired by the Romagna tradition with homemade pasta. VARIATIONS : vegetarian and vegan menus. In the hotel : outdoor playground area, bicycles with child seats, small library, indoor playground area. On request: space for parking the pushchairs, sterilizer, bottle warmer, possibility to heat the milk in the bar. In the room : cots for free use, bunk beds. On request side rails for the bed, tub and bin-eating diapers. At meals : high chairs, placemats with coloring kit, cutlery and glasses, baby menu, baby food with homogenized. Fresh milk available in the morning. On the beach : live entertainment, playground. The Hotel Gened has an agreement with the Bagno Luigi n. 150. Available on the beach playgrounds, playground area for children and entertainment service. Prices are per person per day in a double room for a minimum stay of 3 days. - Reservations by e-mail or telephone will be valid if confirmed by the deposit within 7 days. - The reservation will be confirmed by sending a deposit of 300.00 € per week per room. - DISCONTINUED: In the case where you would have to make your reservation, please inform us in a timely manner. Cancellations made up to 30 days prior to the start of the holiday do not incur any penalty, if canceled later, we will hold the amount of the deposit paid upon confirmation of the reservation. Changes following the booking may not guarantee the same type of room booked. - In case of early departure the penalty will be deducted from the price of the room for 3 nights. - Unwanted meals will be replaced with a basket at customer's request. Book your stay for a minimum of 7 days from the 8th to the 22nd of September 2019, in all treatments .... you will receive a 10% discount! you will receive a 10% discount!